I wanted to explore the issues of bird flu and the commodification of animals, and question the idea of humans taking such high status in regards to the rest of the animal population. Being a vegetarian and interested in animal rights, I was drawn to the notion that avian flu was a poultry revolution – revenge of the chickens. Presenting the work as though through windows gives a sense of voyeurism. 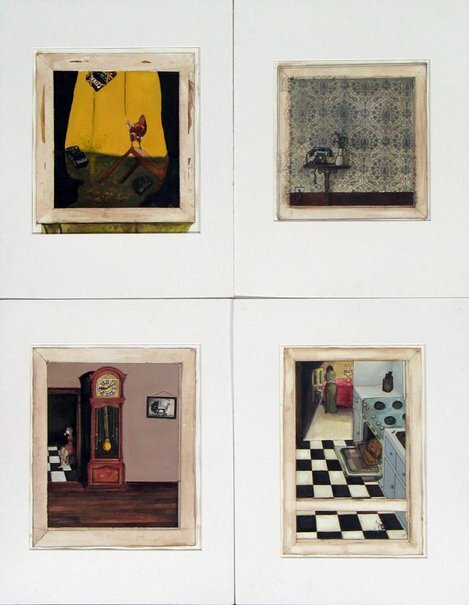 Clues and symbols scattered throughout draw the viewer into the details of the work and the semi-narrative layout. Recurring motifs and textures, and dramatic lighting and composition, highlight the sense of mystery and malice as well as the wry, dark humour.